Mostly when thinking of Variational Autoencoders (VAEs), we picture the prior as an isotropic Gaussian. But this is by no means a necessity. The Vector Quantised Variational Autoencoder (VQ-VAE) described in van den Oord et al’s “Neural Discrete Representation Learning” features a discrete latent space that allows to learn impressively concise latent representations. 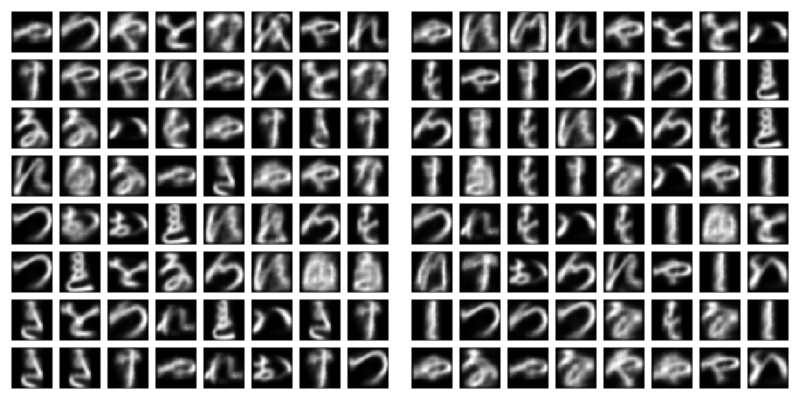 In this post, we combine elements of Keras, TensorFlow, and TensorFlow Probability to see if we can generate convincing letters resembling those in Kuzushiji-MNIST. About two weeks ago, we introduced TensorFlow Probability (TFP), showing how to create and sample from distributions and put them to use in a Variational Autoencoder (VAE) that learns its prior. Today, we move on to a different specimen in the VAE model zoo: the Vector Quantised Variational Autoencoder (VQ-VAE) described in Neural Discrete Representation Learning (Oord, Vinyals, and Kavukcuoglu 2017). This model differs from most VAEs in that its approximate posterior is not continuous, but discrete - hence the “quantised” in the article’s title. We’ll quickly look at what this means, and then dive directly into the code, combining Keras layers, eager execution, and TFP. Many phenomena are best thought of, and modeled, as discrete. This holds for phonemes and lexemes in language, higher-level structures in images (think objects instead of pixels),and tasks that necessitate reasoning and planning. The latent code used in most VAEs, however, is continuous - usually it’s a multivariate Gaussian. Continuous-space VAEs have been found very successful in reconstructing their input, but often they suffer from something called posterior collapse: The decoder is so powerful that it may create realistic output given just any input. This means there is no incentive to learn an expressive latent space. In VQ-VAE, however, each input sample gets mapped deterministically to one of a set of embedding vectors.1 Together, these embedding vectors constitute the prior for the latent space. As such, an embedding vector contains a lot more information than a mean and a variance, and thus, is much harder to ignore by the decoder. The question then is: Where is that magical hat, for us to pull out meaningful embeddings? From the above conceptual description, we now have two questions to answer. First, by what mechanism do we assign input samples (that went through the encoder) to appropriate embedding vectors? And second: How can we learn embedding vectors that actually are useful representations - that when fed to a decoder, will result in entities perceived as belonging to the same species? As regards assignment, a tensor emitted from the encoder is simply mapped to its nearest neighbor in embedding space, using Euclidean distance. The embedding vectors are then updated using exponential moving averages.2 As we’ll see soon, this means that they are actually not being learned using gradient descent - a feature worth pointing out as we don’t come across it every day in deep learning. Concretely, how then should the loss function and training process look? This will probably easiest be seen in code. The complete code for this example, including utilities for model saving and image visualization, is available on github as part of the Keras examples. Order of presentation here may differ from actual execution order for expository purposes, so please to actually run the code consider making use of the example on github. As in all our prior posts on VAEs, we use eager execution, which presupposes the TensorFlow implementation of Keras. 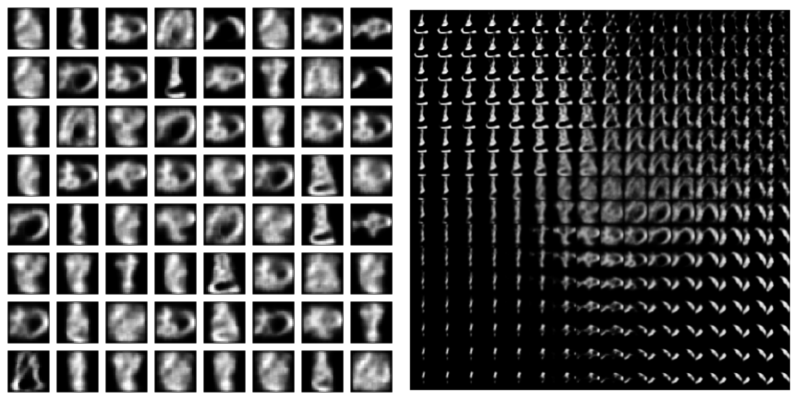 As in our previous post on doing VAE with TFP, we’ll use Kuzushiji-MNIST(Clanuwat et al. 2018) as input. Now is the time to look at what we ended up generating that time and place your bet: How will that compare against the discrete latent space of VQ-VAE? The encoder uses convolutional layers to extract image features. Its output is a 3-d tensor of shape batchsize * 1 * code_size. As always, let’s make use of the fact that we’re using eager execution, and see a few example outputs. Now, each of these 16d vectors needs to be mapped to the embedding vector it is closest to. This mapping is taken care of by another model: vector_quantizer. This model serves two purposes: First, it acts as a store for the embedding vectors. Second, it matches encoder output to available embeddings. Here, the current state of embeddings is stored in codebook. ema_means and ema_count are for bookkeeping purposes only (note how they are set to be non-trainable). We’ll see them in use shortly. In addition to the actual embeddings, in its call method vector_quantizer holds the assignment logic. First, we compute the Euclidean distance of each encoding to the vectors in the codebook (tf$norm). We assign each encoding to the closest as by that distance embedding (tf$argmin) and one-hot-encode the assignments (tf$one_hot). Finally, we isolate the corresponding vector by masking out all others and summing up what’s left over (multiplication followed by tf$reduce_sum). Regarding the axis argument used with many TensorFlow functions, please take into consideration that in contrast to their k_* siblings, raw TensorFlow (tf$*) functions expect axis numbering to be 0-based. We also have to add the L’s after the numbers to conform to TensorFlow’s datatype requirements. Now that we’ve seen how the codes are stored, let’s add functionality for updating them. As we said above, they are not learned via gradient descent. Instead, they are exponential moving averages, continually updated by whatever new “class member” they get assigned. So here is a function update_ema that will take care of this. second, compute and assign the current exponential moving average (updated_ema_means). Before we look at the training loop, let’s quickly complete the scene adding in the last actor, the decoder. The decoder is pretty standard, performing a series of deconvolutions and finally, returning a probability for each image pixel. Now we’re ready to train. One thing we haven’t really talked about yet is the cost function: Given the differences in architecture (compared to standard VAEs), will the losses still look as expected (the usual add-up of reconstruction loss and KL divergence)? We’ll see that in a second. Here’s the optimizer we’ll use. Losses will be calculated inline. The training loop, as usual, is a loop over epochs, where each iteration is a loop over batches obtained from the dataset. For each batch, we have a forward pass, recorded by a gradientTape, based on which we calculate the loss. The tape will then determine the gradients of all trainable weights throughout the model, and the optimizer will use those gradients to update the weights. Now, for the actual action. Inside the context of the gradient tape, we first determine which encoded input sample gets assigned to which embedding vector. In sum, backprop will take care of the decoder’s as well as the encoder’s weights, whereas the latent embeddings are updated using moving averages, as we’ve seen already. First, the reconstruction loss, which is just the log probability of the actual input under the distribution learned by the decoder. Second, we have the commitment loss, defined as the mean squared deviation of the encoded input samples from the nearest neighbors they’ve been assigned to: We want the network to “commit” to a concise set of latent codes! Finally, we have the usual KL diverge to a prior. As, a priori, all assignments are equally probable, this component of the loss is constant and can oftentimes be dispensed of. We’re adding it here mainly for illustrative purposes. And here we go. This time, we can’t have the 2d “morphing view” one generally likes to display with VAEs (there just is no 2d latent space). Instead, the two images below are (1) letters generated from random input and (2) reconstructed actual letters, each saved after training for nine epochs. Left: letters generated from random input. Right: reconstructed input letters. Two things jump to the eye: First, the generated letters are significantly sharper than their continuous-prior counterparts (from the previous post). And second, would you have been able to tell the random image from the reconstruction image? The truth is that there’s a continuous tradeoff between the number of new and exciting techniques we can show, and the time we can spend on iterations to successfully apply these techniques to complex datasets. In the end it’s you, our readers, who will put these techniques to meaningful use on relevant, real world data. Clanuwat, Tarin, Mikel Bober-Irizar, Asanobu Kitamoto, Alex Lamb, Kazuaki Yamamoto, and David Ha. 2018. “Deep Learning for Classical Japanese Literature.” December 3, 2018. http://arxiv.org/abs/cs.CV/1812.01718. Oord, Aaron van den, Oriol Vinyals, and Koray Kavukcuoglu. 2017. “Neural Discrete Representation Learning.” CoRR abs/1711.00937. http://arxiv.org/abs/1711.00937.